When the Swift_2 range launched late last year, the improvement over the original Swifts was immediately evident from the slim metal casing and the fingerprint reader on the back. The central processor was now bumped up from quad-core to octa-core, making it over half as fast again according to our benchmark tests. Bumped up, too, was the price. These new Swifts started in the mid-£100s, pushing above £200 with the top of the range Swift_2X at around £220. The original Swift, officially priced at around £130, had been on offer on Amazon several times at under £100. At that price, the first Swift was a no-brainer entry-level bargain, compared with the equivalents from Motorola and others. But competition has heated up since then, and the place of the new Swift_2s in the market wasn’t so clear as 2016 wound to a close. The death of the Cyanogen operating system didn’t help either. But the April over-the-air update to Wileyfox’s version of Android 7.1.1 changed all that. And, in the meantime, the first generation Swifts have been similarly updated too. Parts 1 and 2 of this review were overviews of the hardware and the software. It’s time tie up some of the details and present our verdict. 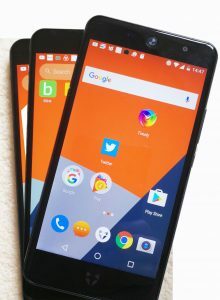 ONE OF THE MAIN SELLING FACTORS of the original Cyanogen operating system running on the Swift—at least, according to Wileyfox—was an integrated app called Truecaller. In fact, it was so deeply integrated that it was just called “Phone”. Truecaller has been reinstated in the new Android 7.1.1 implementation as part of the same phone app, which for some reason now calls itself “Telephone”. Truecaller’s claims make it sound like something you’d want on every phone. If your experience is anything like ours here at Tested Technology (we have a lot of phones) hardly a day will go by without a cold call from someone telling you you’ve been involved in a car accident recently, or asking for a moment of your time to explain a three letter acronym that will save you hundreds of pounds. Android can block such calls, but only once you know the phone number. Truecaller sees the nuisance coming, thanks to a huge crowd-sourced database of cold-calling culprits. But it’s that database that worries me. I’m not attributing any malign intent to the (I’m sure) impeccably motivated Swedes behind Truecaller. But the way that crowd-sourced database has been acquired raises legal issues that I discussed in the review of the Wileyfox Storm last year. Our own contact list here at Tested Technology is very long, and checking to get the consent of every member would be an entire career. We could, of course, have created a dummy list for testing purposes, but this artificial experiment probably wouldn’t reflect real-life use. So this is one test we decided to pass on. If you’re a Truecaller user, we’d definitely encourage you to contribute your own experience. That’s what the comments section is for. Android Pay is another app that Wileyfox has chosen to lock into its new version of Android. Of course, that doesn’t mean you have to use it, and you can always disable it (Settings/Apps/Android Pay/Disable). The app (which you can also download from the Google Play Store onto other Android phones) is the equivalent of the iPhone’s Apple Pay and works with a service Google launched originally in the States in the late Summer of 2015. It arrived here in the UK in May 2016 and is available wherever you see the Android Pay symbol. But you’ll need the compliance of your bank. Most of the UK high street banks support Android Pay, with the exception of Barclays and TSB. Obviously, the payee will also have to be Android Pay compliant, but any vendor using contactless payment will already be set up for this. Useful for services like Transport for London—although you might find yourself stuck on the Tube if your battery runs down en route. As well as real-life contactless payment, you can also use Android Pay from inside “your favourite apps” (as Google puts it). This seems to mean “just some phone apps like Hungryhouse and Deliveroo”, as the list cited by Google isn’t that long. Android Pay has a top limit of £100. It’s a natural for the NFC-equipped Wileyfox Swift 2s as it works with the fingerprint reader (only necessary for payments over £30). Like PayPal, Android Pay uses a buffer account, so the payee never gets to see any of your bank details. But you’ll need to weigh the advantages against the risk of adding yet another door (however secure) into your electronic cash stash. One of Cyanogen’s neat tricks was to be able to fade some of the blue out of the smartphone’s screen as evening descended. There’s a clear scientific consensus that the short wavelength radiation from our TV, computer and phone screens (the blue end of the spectrum) interferes with our circadian rhythms, messing with our sleep. There’s also a suggestion that it may be a partial cause of some of our so-called “civilised diseases”: cancer, diabetes, heart disorder, and obesity. A System setting in Cyanogen called LiveDisplay would automatically adjust the colour temperature of the screen between the hours of sunset and sunrise, clipping the short-wavelength end of the spectrum to produces a warmer screen less likely to keep you awake. LiveDisplay would also allow you to set your preferred colour temperatures for the daytime and nighttime periods. A good deal of this reappears in the new pure Android operating system update. 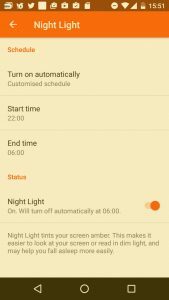 Now called Night Light (not to be confused with the Torch function), this is a standard feature of Android Nougat, although some implementations hide it. Night Light improves on LiveDisplay by allowing you to set specific on and off times, although you can still use the automatic sunset to sunrise parameters if you like. Missing, though, is the ability to set your own preferred colour temperature values. The night colour temperature forced on you announces that it “tints your screen amber”. Maybe it’s just me, but I find it’s a shade too Trump-tainted Tango-tinted. Uncommonly, these days, the Swift 2s all incorporate FM radio. Of course, even without this feature, you can still tune in with apps like TuneIn Radio or Radio Online. But the Swift 2’s version is genuine old-fashioned, broadcast FM radio and won’t eat up any of your GSM data if you’re on a limited data plan. A phone would have to be large to incorporate an FM aerial. FM has a frequency of the order of 90MHz, which means the wavelength is around 3.3m. GSM frequencies are about ten times that so the wavelength is down around 3.3cm. Optimal aerial length is a function of wavelength, so FM isn’t going to get a look in without an aerial ten times larger than the ones embedded in your phone. The solution is to use the earphone cable as the FM aerial. This works surprisingly well, but obviously precludes using Bluetooth earphones. There is, however, an option to play FM through your phone’s loudspeaker, as long as you have earphones plugged in. 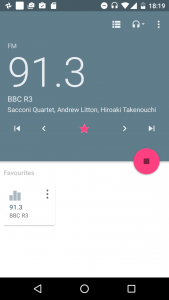 The neat user interface for the FM app lets you scan across the frequencies automatically or manually to find stations, which you can then favourite (the red star in the screenshot) and optionally rename. You can also hit the red button with the back square in middle to record the programme. Inevitably, FM on a small mobile device is going to be a hit and miss business. I found with decent earphones (like the Optoma NE800Ms) I could get a musically acceptable signal, even while moving around. The absence of FM wouldn’t be a deal-breaker for me (my current favourite high-end phone, the Mate 9 doesn’t have it) but it’s certainly a nice-to-have option for the new Swift 2 range. It’s taken more column inches than I thought to explore the implications of these newest Wileyfox offerings. When the Swift 2’s first launched, the quality of the hardware at these mostly sub-£200 prices spoke for itself. The big question that hung over them—the future of the operating system—is now thoroughly resolved. Wileyfox has turned that corner very deftly. For me, though, one big “but” remains. What is that Swift 2X all about? It spills over the top of the £200 price bracket with—as far as I can make out—very little advantage. As a result of our tests here at Tested Technology I can happily recommend the Swift 2 (for Android beginners) and the Swift 2+ (for power users on a modest budget). There’s nothing in particular I can fault in the Swift 2X, as it’s just a very slightly larger, slightly more talented camera-wise Swift 2+. My only question about it is Why?